Okay, girls. We're 3 weeks into the new year, so I decided it's time. I've had the thought that it was time before, but, obviously it wasn't. I got a FB message from a friend a couple of months ago, telling me that her summer interclub tennis team was looking for more players. Was I interested? Oh, how I chuckled. I haven't picked up a tennis racket in over a year. They must be desperate, because I would surely just be a warm body. I had concerns about saying yes, the main one being my history with dehydration headaches. If you've never had one, believe me when I tell you they are no fun. I'll be okay while I'm playing, but about an hour after I stop, it starts. Nothing helps it. I used to be able to lay down and sleep, then it would be okay when I woke up. Then that didn't work. I have this nifty little towel that I keep in ice water when I play; it cools you down in a heartbeat. That doesn't help. I did discover last summer that if I drank a couple of bottles of pedialyte, the headaches weren't so severe. I make sure I stay hydrated before, during, and after I play, but I sweat (yes, I sweat, I don't perspire) so dadgum much that I just can't hydrate enough. So, of course I told my friend yes, I'd play, if she was sure that they wanted me. She said they did. Looks like I'm gonna play tennis this summer. The good thing is that our practice time is 8:00, so we'll be done before it gets really hot. That's one day I won't have to worry quite so much about the headaches. One thing that I think will really, really help is if I would just get some of this weight off. When we lived in SC, there were days during the summer that I would play 2 times a day. I was also 30 pounds lighter. I know there's no way I'm going to get this weight off before summer, but hopefully I can get some of it off. I absolutely love to play tennis. There's just something about hitting that near-perfect shot, slamming the ball down someone's throat (Letting go of a little pent-up aggression is good, right? ), or hitting a serve just right. I'm not that good, but I have such a good time when I'm out on the court. So, yes, I've finally decided that it's time to do some serious exercise and to eat right, and to cut out the sugar. I started the "Slim in 6" today...I could barely walk after, but it's going to get better, right? I may not be slim in 6 weeks, but hopefully I'll be on my way to being headache free when I play tennis! Guess I better start stocking up on pedialyte...just in case! The first summer interclub team I was a part of after we moved to Tn. We were together for a couple of years before everyone went their separate ways. 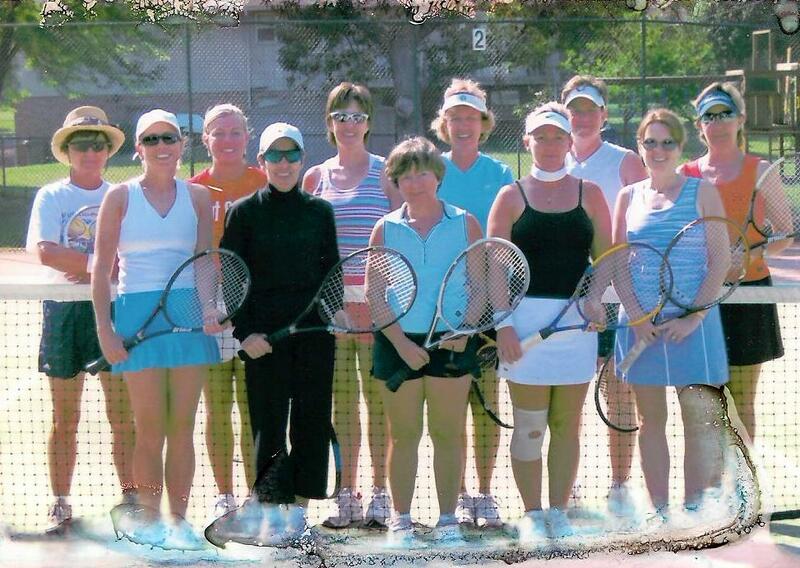 The lady in the back row with the straw hat is our "pro"...she's one of the top over 60's players in the country. Good times! **H-Mama at Family Team is having a give-away! If you've never visited her, take a minute to go meet her and her beautiful family. And, if you enter her give-away, I think you shouldn't miss this post. She's a natural, isn't she? I'm sure you will be ready for the first practice this summer. Good luck. Awww... Thanks for your sweet words. :) Tennis? I have no. hand. eye. coordination. at. all. But the outfits can be cute, yes? Dehydration headaches? Bless your heart! Crossing fingers for you that it won't be an issue this year. Good luck with the "Slim in 6". One tip I wished I'd known was to immediately do the stretch workout right after. It'll help with the soreness. It's only been a year since you picked up a racket? I'm impressed! I haven't played tennis in um about 25 years! 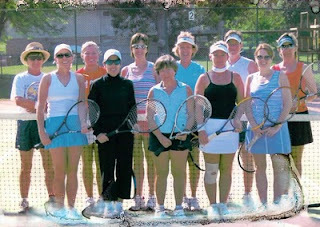 Oh, how I would love to play tennis again! You are so lucky! You are going to have a lot of us cheering you on. You can do it!!! I loved tennis when I was younger. Now I can barely play Wii tennis. haha Good luck and have fun!! Fun! I used to play tennis. I actually did it just to keep in shape during the winter, when I wasn't playing softball. It helped so much with the eye hand coordination. I hope you can keep those headaches at bay! I can't imagine these dehydration headaches you get....horrible! Best of luck with your new 'team'...I've never been coordinated enough to play tennis. Good for you. That will be great exercise and fun for you. Hopefully you will get your headaches taken care of with some weight loss and extra hydration. I've never really played tennis, maybe a little in PE at school.